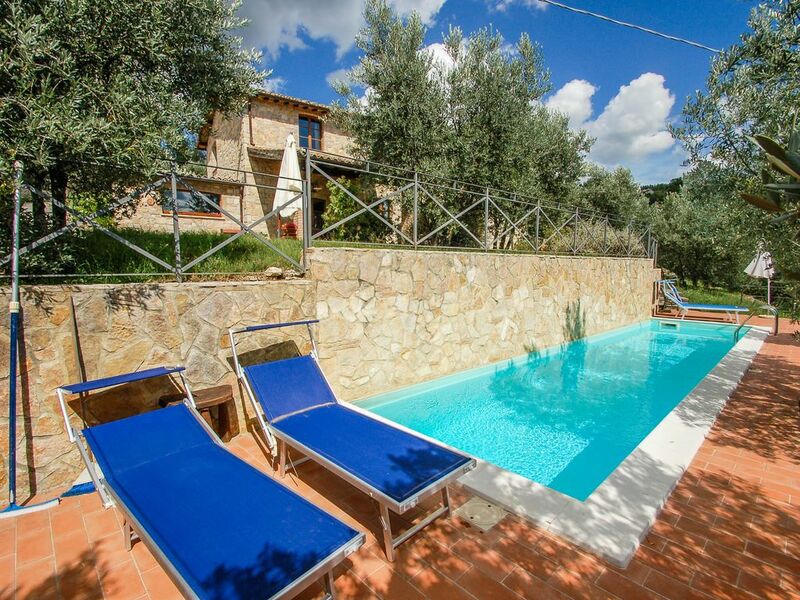 The villa lies 500 meters from the charming village of Montecchio in a hilly location with great panoramic views. From the villa you have a panoramic sight on the valley of the Tevere and the village self. The property has an own garden with swimming pool (equipped with parasols and sun loungers), there are also 2 bikes at disposition. The whole property is for private/excluive use of the tenant. It is suitable for up to 8 persons. There are 3 bedrooms (two with double bed and one with 2 single beds, there are also two extra beds available). In front of the house there is a porch with table and chairs to eat outdoor and enjoy the panoramic views. There is also barbecue at disposition to cook. The villa has one the ground floor: a well equipped kitchen, dining and living area, bedroom with double bed and a bathroom. On the first floor there are 2 bedrooms and 2 bathrooms. All the most common household appliances are available. Wi-fi internet connection available. In the village of Montecchio thereare: bar, baker, 2 butchers (by one it's also possible to buy cooked meals), small supermarket, grocery store, pharmacy. There are 3 more supermarkets and other shops in Baschi (11km). Big supermarket, often open on Sunday, available in Orvieto Scalo close to the motorway exit. Recommendend restaurants: La Perla (in the centre of the village of Montecchio, it has also takeaway service), Sala della Comitessa (Baschi, 11 kms), Casa Vissani (Baschi at 11 kms...high quality but very expensive), Il fontanile (7 kms from Montecchio). At 10 km it is possible to visit the Falesco winery (visits and tasting from Monday to Friday). From Montecchio it's possible to reach quickly the principal cultural and naturalistic beauties of Umbria, Rome and northern Lazio, southern Tuscany (it's at 20kms from the motorway Rome-Florence, exit Orvieto). The train station of Orvieto is at 25 Kms, from the train station it is possible to reach Rome and Florence in around 1h30. Ground floor: kitchen, dining/living room, bedroom, bathroom. First floor: living room, 2 bedrooms, 2 bathrooms. Swimming pool (11m x 3m depth: 1,4m-1,6m). One bathroom on the ground floor, 2 bathrooms on the first floor. Swimming pool (11m x 3m depth: 1,4m-1,6m). Open from the end of April to the first half of October. My husband, daughter and I wanted a holiday where we could de-stress, do a bit of tourism and cook, which we don't get to do enough with work/university. This was the perfect villa for that. The villa is lovely with lots of little touches that add to the comfort of the place. The bedrooms are comfortable and all have large fans for those hot nights. There are three tables - two inside and one outside which is well shaded and near the kitchen. Montecchio village is a 2 minute drive away and has a small store, butchers, green grocers. It also has 4 restaurants (2 of which were open). Een groot huis met veel privacy en een heerlijk zwembad! En wat een uitzicht!!! Montecchio ligt op loopafstand en is een prachtig dorp! Tijdens ons verblijf elk weekend feest!! Prachtige omgeving om Umbrië te verkennen. Guido is erg behulpzaam, reageert snel op eventuele vragen, top!! Heerlijk huis met fantastisch uitzicht ! Wij hebben genoten van het fijne ruime, comfortabele huis. Wij waren met 5 personen, waaronder 2 tieners. Het uitzicht is prachtig. Misschien een tip om de olijfbomen wat te snoeien bij het terras, zodat je daar ook van het uitzicht kunt genieten. Het zwembad was heerlijk voor de warme dagen. Fijn contact met de verhuurder/beheerder ! Kortom, heerlijke week gehad ! The place had all the amenities and was very convenient to many towns (e.g., Assisi, Orvieto) and attractions. Also the place was actually nicer than the pictures. Beautiful spacious house with a stunning view. Beautiful house, a well kept garden, one toilet didn't flush though. Restaurant La Perla in Montecchio was fenomenal! In Umbria, a region that has gained a name for being the green heart of Italy, tourism is growing because of the unfamiliar harmony between nature, antiquities, historic centres and culture. The quiet of the countryside, good provisions and an inimitable cuisine are the great draw. This region is less touristy than Tuscany and this is especially appreciated by many tourists. It forms an ideal starting point for enjoying the peace of the surrounding hilly and mountainous landscape and on the other hand making trips to beautifull towns like Todi, Orvieto, Narni, Spoleto, Perugia, Gubbio, Assisi. You can also easily visit – in day trips - famous towns and charming villages in the southern part of Tuscany such as Siena, Arezzo, San Giminiano, Pienza, Cortona, Sinalunga, etc. Many tourists visit also Rome from here, without staying in the city which is very hot in summer. It is possible to go by car (journey of 1h-1h30) or by train from the stations of Terni, Narni-Amelia, Orte & Orvieto. Orvieto is a place of great historical importance. So you see tourists the whole year round. Lots of them only visit the well known cathedral, the cathedral square and the central street full of ceramics and souvenir shops. They are wrong, because there is a lot more to see in this city and even more in the surrounding area. You have to go right through Orvieto to get a real impression of the unfamiliar setting of the city and the gleaming city walls on the volcanic tuff stone hill, plus characteristic monuments and museums with Etruscan finds.